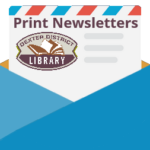 The Dexter District Library is strongly committed to the provision of services to children and desires children of all ages have positive library experiences. However, the Library is a busy public facility and Library staff cannot assume responsibility for the supervision, safety or entertainment of children who use it. A parent or other adult accompanying a child in the Library is expected to prevent the child from running, making excessive noise, crying, pulling books from shelves, pounding on computer equipment or otherwise behaving disruptively. If the parent or caregiver cannot control the behavior of the child, both will lose Library privileges pursuant to the procedures set forth in the Patron Behavior Policy. Children five years of age or younger must be under the direct supervision of a parent or other adult (age 18 years or older) at all times. When a child of this age attends Library programs, the parent or other adult must remain in the Library and be readily available to provide supervision or remove the child if necessary. Children ages six through eleven may use all areas of the Library alone, but a parent or other adult must be on the Library premises. Children aged twelve and over are welcome to use the Library without an adult on the premises. All children, whether accompanied by an adult or parent or using the Library alone, must observe the rules that govern Library use, including but not limited to the Library’s Rules of Behavior Policy and Internet Use Policy. The Library is not meant to be a substitute baby-sitter. Children visiting the Library alone are welcome to remain as long as desired, provided the child is busy reading, writing, doing school work or using other library resources. Children who become boisterous, undisciplined, uncontrollable or otherwise in violation of any Library policy may lose Library privileges. Children who are not picked up within 15 minutes after the Library closes will be referred to the Sheriff’s station to wait for a ride.